The first principle of my blog is Creating Ecosystems of Success, and a key focus is awareness of the Science, Technology, Engineering and Mathematics (STEM) fields. A key class for many STEM-hopefuls is ‘college- level’ General Chemistry, both in high school and college. 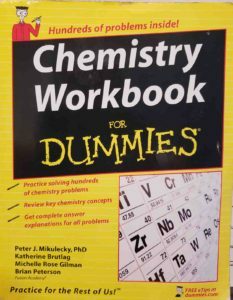 Some students, particularly those attending very competitive high schools, take college-level Chemistry and struggle with it. Several years ago when I tutored part-time, I worked with several students in Northern Virginia where taking ‘Honors’ and ‘International Baccalaureate’ (IB) General Chemistry as freshman and sophomores was a normal occurrence. For three to four years, I worked in the former Northern Virginia Tutoring service where I consistently coached lost and struggling students, and helped them confidently finish their classes strong. The service was run by my mentor and fellow blogger Dr. Ralph G. Perrino (Dr. Perrino’s blog). I originally published this piece on the Examiner back in March of 2013. I’ve decided to republish this revised version as tutoring was a fun and rewarding experience for me, which also helped me earn some extra income. 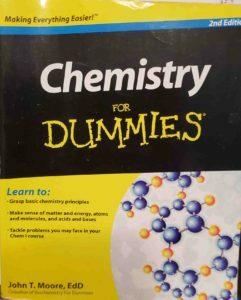 I myself didn’t fully grasp General Chemistry back at Hutch-Tech High School as a sophomore. It wasn’t until I was an undergraduate at Johnson C. Smith University (JCSU) that I understood and mastered this exciting quantitative science. I went on to use that knowledge in my graduate studies, in my federal science career, and eventually as a tutor. After starting my federal science career, tutoring not only allowed me to supplement my income, but it was a very educational experience for me as well. When applying to work as a tutor through the Northern Virginia Tutoring Service, I listed Biology, Chemistry, and Physics as my areas of expertise. I had some experience with all three disciplines in my undergraduate and graduate studies. Chemistry by far was the course that generated the most demand for me, specifically ‘Honors’ and ‘International Baccalaureate’ (IB) Chemistry. IB courses are basically ‘college-level’ and can be quite a jump for some high school freshman and sophomores. Even some upperclassmen struggle in them. These classes are particularly problematic when the students fall behind in them early, lose confidence, and when the subject area falls outside of Mom and Dad’s areas of expertise – hence the need for a tutor. The students who needed my help weren’t ‘slouches’ by any means. Most of them resided in Virginia’s Arlington and Fairfax Counties. Fairfax County is one of the wealthiest counties in the nation – a county with a very strong school system where 90% of its students matriculate to college. The parents’ vigilance and drive to assure that their children do well academically is also a hallmark of this county. This was manifested in their willingness to invest some of their hard-earned money into tutors – sometimes several at one time for multiple children. Those parents were very impressive. When working with the students, my initial goal was to approach them with a positive and optimistic attitude. Patience, understanding and a bit of humor were parts of my approach as well. These were particularly important for students who had lost hope. After this initial part, we dove into the actual science and turning their grades around. There were four key principles that I stressed to my students: time management, taking initiative, practice and attention to detail. The kids I worked with were ‘high achievers’ and typically juggled multiple classes, and in some instances, multiple Honors/IB courses. They were also involved in a plethora of after school activities (sports and clubs of all kinds), which often caused a bit of an overload. In cases such as these, time management for each class, especially the demanding classes, was very, very important. The next principles I instilled were taking initiative and the importance of practice. College-level courses require students to assume more responsibility for their studies with less coddling by teachers. This is especially important for quantitative sciences like Chemistry and Physics, which are calculation-intensive and require rigorous practice. I stressed to my students that this was the only way to feel confident at test time, when students were tasked with working their way through several pages of complex problems, usually within 45 minutes to an hour. The argument that teachers aren’t ‘teaching effectively’ in these subjects may be partially true in some instances, but what’s also true is that the teachers can’t do everything. They can’t make the students practice what they’ve learned after hours and on weekends – arguably the most important part their learning. This is where the most meaningful part of students’ learning takes place as was the case for me as an undergraduate when the light-bulb turned on one Sunday afternoon in Charlotte, NC. Finally, I impressed upon my students the importance of learning to pay attention to several key details. Chemistry tends to start off with ‘concept-based’ learning: the trends of the “Periodic Table of Elements“, the micro-particles that comprise atoms, and then chemical bonding. With the balancing of chemical equations, the class becomes more ‘critical thought-based’. The ‘quantitative’ phase starts with the “Stoichiometry” chapter which permeates throughout the remaining chapters. This is the phase in which the calculator becomes one of the student’s ‘best friends’ as they must calculate decimals, express numbers using ‘scientific notation’, and sometimes calculate ‘log’ values. When calculating acids, bases and pH values, students also must be able to use the ‘^’ calculator function in some instances, which admittedly confused me as the tutor once. 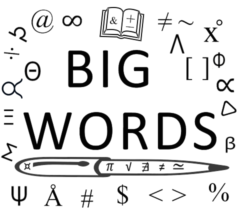 An important part of this phase is understanding and being able to convert ‘units of measure’ – converting grams to kilograms, and then grams to moles, Celsius and Fahrenheit to Kelvin, and so on. The calculation of moles, percent compositions, percent yields and so on, leads the class to become highly quantitative and the students then must also keep track of various equations/formulas, and chemical/physical constants, while also integrating concepts from earlier chapters. This continues into the “Solutions”, the “Gas Laws”, “Kinetics” and “Thermochemistry” chapters. While specific calculations are used throughout the course such as the conversion of grams to moles, some chapters have their own unique equations, formulas and units of measure such as ‘millimeters of Mercury’ (mm Hg) in the Gas Law chapter which is a measure for atmospheric pressure. Examples of chemical/physical constants include “Avagadro’s number”, and the “Universal Gas Constant”, which itself has many different values depending upon the units used. 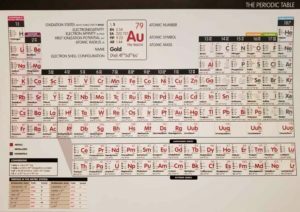 As we progressed through the chapters, one thing I constantly had to remind my students of was always keeping their Periodic Table of Elements handy. I consider this the student’s first best friend in the class, as it has pieces of information about every element necessary to answer questions in even the more advanced chapters. This all sounds like a lot right? Again, it can be particularly problematic if the parents have no experience in the area. Once lost, students typically need extra help in the form of spending more time with the teacher or working with a tutor. When the above-mentioned keys are introduced and the student buys in, he or she can gain confidence, get back on track and find the class to be fun. Tutoring caused me to have to relearn some material I’d forgotten over the years, and to learn concepts we hadn’t covered when I was an undergraduate. In some instances I was learning along with the students I tutored. This was fun for me and created a sense of adventure. If you’re a STEM-professional, tutoring is a really good way to generate a second income depending upon the demand for your knowledge set in your area or elsewhere. With the technology available to us today, tutors can work with students remotely in some instances without having to physically be there. In either case, helping students to understand their subject matter, and ‘to get over the hump’, is a very rewarding feeling, and an accomplishment all in itself. It’s also gratifying when the parents thank you and stay on their children about when their next tutoring sessions will be. What also helped me out during my tutoring experience was that I could go back and ask one of my veteran undergraduate Chemistry professors questions when I got ‘stumped’. In some instances, I needed to be refreshed on some of the nuances of some of the problems I was doing with my students. I don’t think he’ll mind me mentioning him, and I’m very thankful that he was willing to provide guidance when I didn’t know what to do. This underscores the importance of not burning your bridges and maintaining relationships with your professors long after you’ve earned you degree. 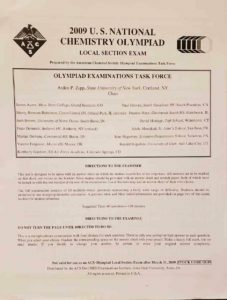 My former professor also pointed me in the direction of the Chemistry Olympiad Exams for challenging and fun practice problems. You can download the yearly exams as pdfs for free. The answers are in the back, so you can go over them yourself or with your student, and even work your way backwards to figure out the right answer, if either of you answered the question incorrectly.